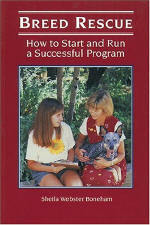 Explains the business of forming and operating a dog breed rescue program. Avoid legal problems, deal with the paperwork, train and manage volunteers, raise funds, and get valuable publicity by following Boneham’s advice. Sample forms, important contacts, guidelines for health, sanitation and more. PUBLISHERS COMMENTS A first of its kind! Now you have all the information you need to start a breed rescue program. Learn how to: get organized; find, train and manage volunteers; gain financial support; network with shelters and other rescue groups; find the dogs; screen dogs for medical problems; determine the dogs temperament and behavior; place rescued dogs; and publicize your program. Plus, important contacts and addresses, and sample documents that will help your organization and keep you organized.